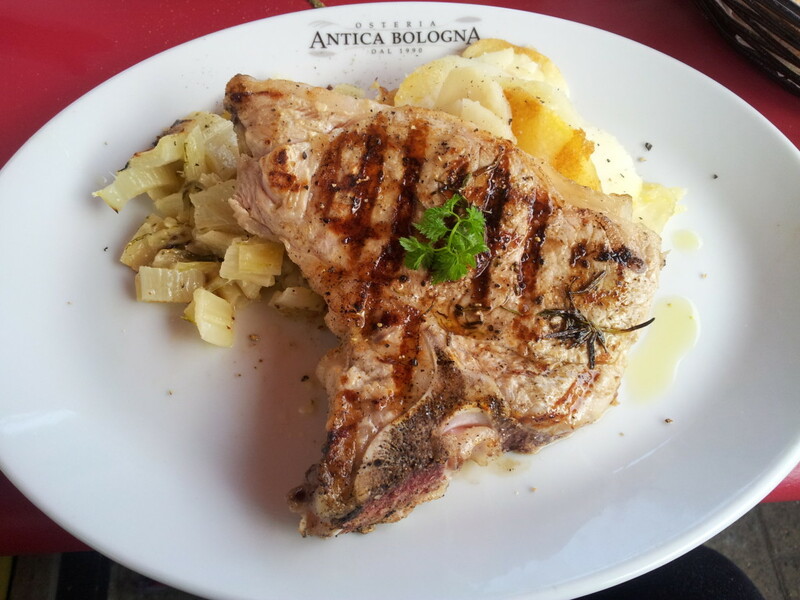 I hadn’t planned to review Osteria Antica Bologna, hence the mobile phone pictures, but I had such a great experience, that I wanted to share this place with you all. Osteria Anitca Bologna is an Italian restaurant located on Battersea’s Northcote Road, that serves up simple north Italian cuisine. The menu isn’t very long, so you’re not going to be overwhelmed with choice, but there is enough on there to make you feel like you have options. I dined true Italian stylee and ordered a small pasta bowl of Tonnarelli al ragu di cinghiale to start and the veal chop special of the day for secondi. 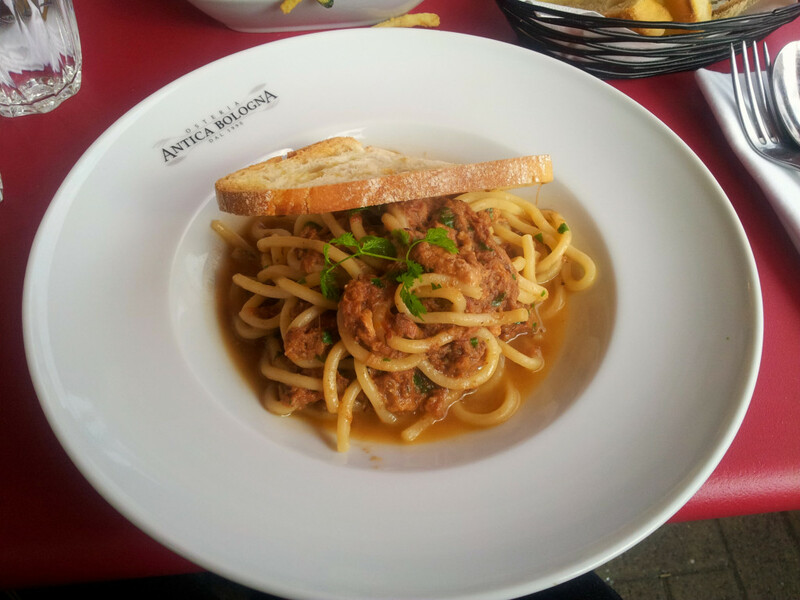 The Tonnarelli al ragu di cinghiale is a wild boar ragout served atop fresh spaghetti pasta. The dish was not all what I was expecting; in my mind I had pictured a bolognese dish which used minced wild boar in place of minced beef. What I was presented with was way better! The wild boar is what I imagine good pulled pork probably tastes like – juicy and tender, the meat almost disintegrating when I scooped a mouthful onto my fork. I am not a fan of the crunchy al dente pasta, so really appreciated that the spaghetti was firm, but still cooked through. It probably makes it easier to avoid that crunchiness when you use fresh pasta as opposed to dried – take note generic Italian food chains (PEW PEW!). 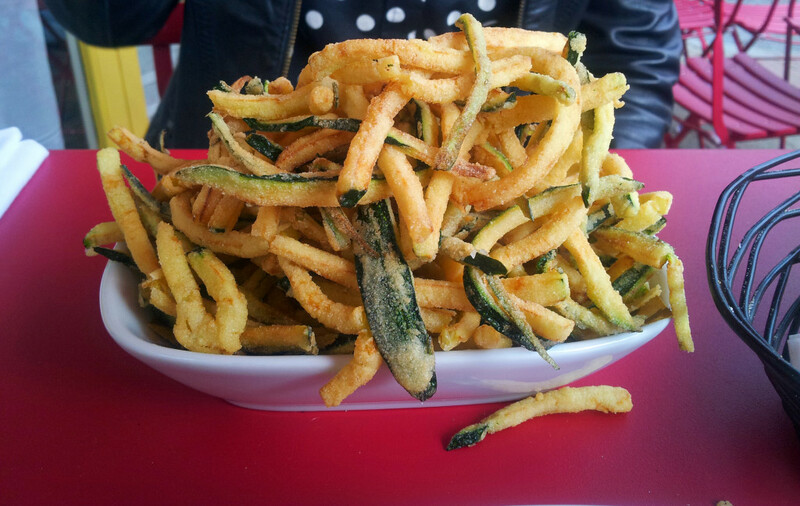 I also managed to snag some of my friend’s zucchine fritte (zuchinni/courgette fries). They were yummy. Order these. You will love them. The veal chop special was a bit of a let down. The potato gratin and the swiss chard were fine but the veal chop was totally undercooked. I realllllly gave it a good go before sending it back, but it was a bit like eating under-cooked chicken. You know, where the muscle fibres are still pretty tough and difficult to cut through and the meat has that bouncy, springy firmness? Don’t ever make the assumption I did, that veal cooked rare resembles the texture of beef steak cooked rare. It doesn’t. I just thought big cow, baby cow – same texture, right? Naaah! Fortunately, the waitress and kitchen staff were great and offered to replace the dish with something else, so I went with fish. 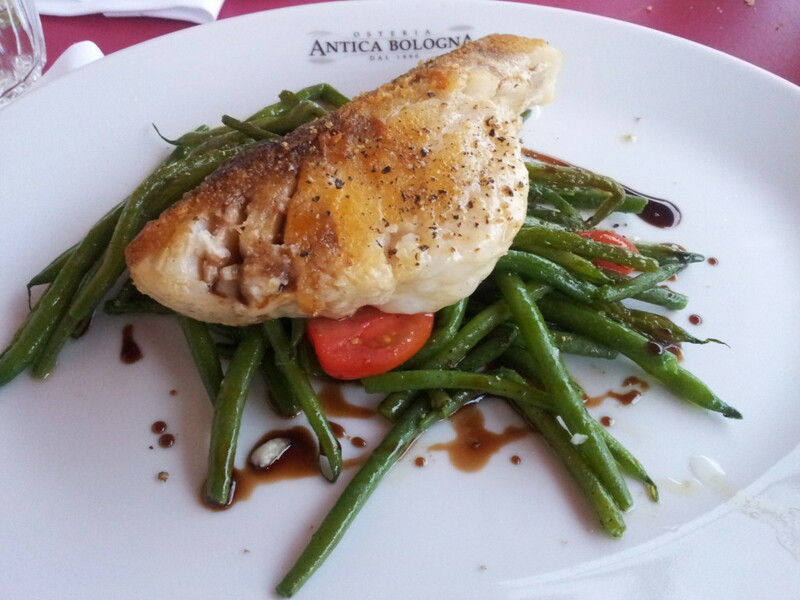 The Filetto di merluzzo con fagiolini & Aceto Balsamico – pan fried cod fillet with green beans, cherry tomatoes and balsamic dressing – was delightful. The cod was light and flaky, seasoned well with salt and pepper and had this deliciously crispy skin. Anybody else love crispy skin on food??? 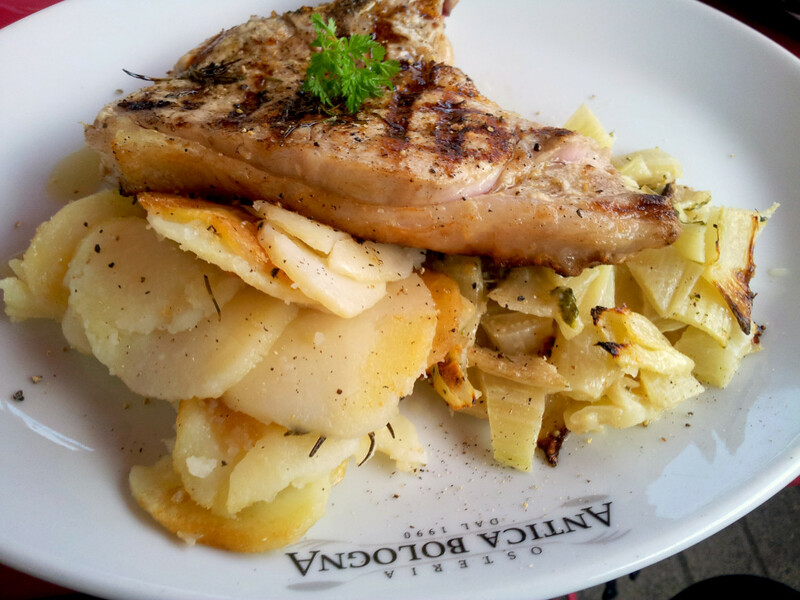 Fish, chicken, potatoes…. Mmmmmm! The green beans retained a nice crunch, while the acidity and sweetness of the balsamic dressing and cherry tomatoes, helped to add an extra dimension to the flavour of the green beans. If the review above hasn’t convinced you to give Osteria Antica Bologna a try, then I’d also like you to know that they will give you a FREE basket of fresh bread for your table, FREE still or sparkling filtered water and FREE amaretti cakey biscuit things, which my friend swears were delicious! I cannot eat nuts, so she got to have all four to herself. We chose to eat outside, as the sun was out and if the weather permits (and you don’t mind the cigarette smoke), I suggest you do the same when you visit, because its way easier to pretend you’re somewhere on the continent when you are dining alfresco. If you are local to Northcote Road or happen to be in the area, it is definitely worth dropping in to Osteria Antica Bologna for a meal. This isn’t your generic Italian restaurant chain. The food is fresh, simple and tasty and the service is attentive and friendly. If you enjoyed this review, please don’t forget to click the “thumbs up” button below and let me know your thoughts in the comments!